Environmental variables (including natural and anthropogenic stressors) and meiobenthic communities were sampled in a 'natural' (Rooiels) and a 'disturbed' (Lourens) estuary in the Western Cape, South Africa, bimonthly for 20 months. A primary aim of the study was to assess if the meiobenthic community structure is driven by different variables when comparing 'natural' versus 'disturbed' system. Due to the much smaller catchment of the Rooiels Estuary, many environmental variables were significantly different (p< 0.001) from the variables in the Lourens Estuary, e.g. salinity, temperature, pH, total suspended solids, nitrate and depth. No pesticide concentrations were expected in the Rooiels Estuary due to the absence of agricultural development in the catchment. However, chlorpyrifos (8.9 µg/kg), prothiofos (22.0 µg/kg) and cypermethrin concentrations (0.42 µg/kg) were detected frequently, with the highest concentrations recorded during the summer months. Principal response curve analysis showed that temporal variability between sampling dates explained 42% of the variance in environmental variables and pesticide concentrations and spatial variability between the 2 estuaries explained 58%. Variables contributing most to the differences were higher concentrations of endosulfan, p, p-DDE and nitrate concentrations in the Lourens Estuary and larger grain size and higher salinity at the bottom in the Rooiels Estuary. In general the meiofaunal community in the Rooiels Estuary showed a significantly higher number of taxa (p< 0.001), a significantly higher Shannon Wiener Diversity Index (p<0.001) and a generally lower meiofaunal abundance with less variability than in the Lourens Estuary. The differences were mostly explained by a higher abundance of Cypretta and Darcythompsonia in the Rooiels Estuary and a higher abundance of Thermocyclops and Canthocamptus in the Lourens Estuary. 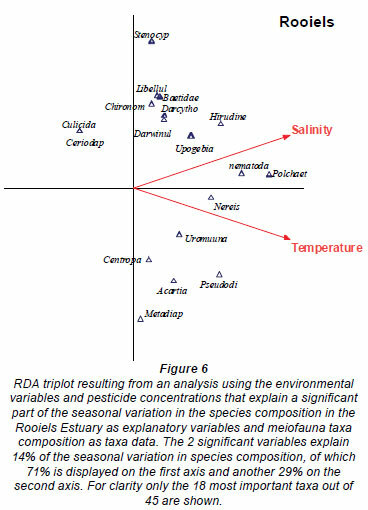 The variables explaining a significant part (14%) of the variance in meiofaunal abundance in the Rooiels Estuary were salinity and temperature, with the Redundancy Analysis indicating that the abundance of most of the taxa increased with higher salinity and temperature, e.g. Upogebia, Nereis, Uroma and nematodes were clearly positively correlated to salinity and temperature. 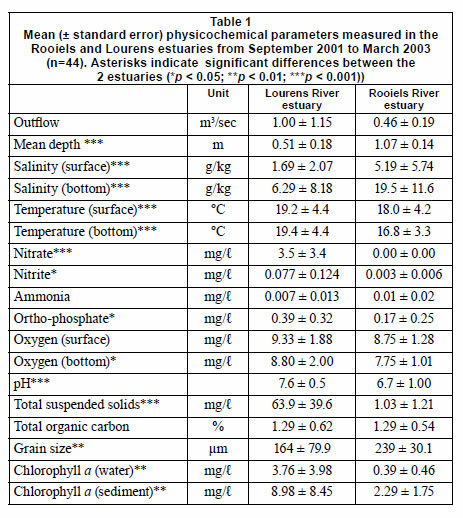 The variables explaining a significant part of the variance in the dataset (43%) within the Lourens Estuary were also salinity and temperature but included chlorpyrifos, nitrate and flow (including river and tidal flow). Temporarily open/closed estuaries (TOCEs) are the dominant estuary type in South Africa, comprising 73% of all estuaries (Whitfield, 1995). Similar systems, sometimes referred to as 'blind', 'intermittently open', or 'seasonally open' estuaries, are also found in Australia, on the west coast of the USA, in South America and in India (Ranasinghe and Pattiaratchi, 1999). TOCEs are often closed off from the sea, and the lack of freshwater input and tidal exchange may result in changes in various physicochemical variables (e.g. salinity, temperature, flow) and anthropogenic stressors (e.g. pesticides). This spatial and temporal variability within TOCEs can have direct and indirect impacts on the biota (e.g. zooplankton, meiofauna, ichthyofauna, phytoplankton) (Kibirige and Perissinotto, 2003). Limited long-term monitoring data exists for TOCEs, making it difficult to recognise the degree of variability in these estuaries and the factors influencing their communities. A few studies have sampled different variables on a monthly basis (Nozais et al., 2005, Kibirige and Perissinotto, 2003) and others on a seasonal basis over a period of up to a year (Perissinotto et al., 2000) or several years (James et al., 2008). These studies indicate that there is considerable temporal variability within these systems. The present study is one of the first to examine natural variables, anthropogenic stressors and community responses in such estuaries over a period of 2 years. One of the factors limiting our understanding of South African estuaries is the lack of long-term monitoring data. The National Water Act (Act No. 36 of 1998) in South Africa recognizes basic human water requirements as well as a need to sustain the country's freshwater and estuarine ecosystems in a healthy condition for present as well as future generations (Adams et al., 2002). A National River Monitoring Programme has been in place in South Africa for many years (DWAF, 2006) but no equivalent has yet been designed for estuaries. Many estuarine and coastal management initiatives worldwide (e.g. North America, Europe and Australia) are required to derive and use environmental quality indices; examples include implementation of the European Water Framework Directive and the UC Clean Water Act (Quintino et al., 2006). Those indices are then used to test for departure from a reference or control condition. Thus to be able to identify the impacts of anthropogenic stressors such as pesticides, it is important to understand the natural spatial and temporal variability in physical and chemical conditions and their impacts on community structure. It is therefore crucial to understand the driving variables by examining natural estuarine systems whose catchments are not associated with any anthropogenic activity. To achieve this, the dynamics of abiotic and biotic variables of a natural system need to be compared with those of a disturbed system using a multivariate approach such as the principal response curve (PRC). The PRC approach has been shown to be valuable in statistically analysing multiple endpoints (Van den Brink and Ter Braak, 1999) and has already been used for biomonitoring by Den Besten and Van den Brink (2005) and Van den Brink et al. (2009). For the purposes of the current study the Lourens Estuary represents a disturbed system and the Rooiels Estuary an undisturbed or reference system. Previous research (Bollmohr and Schulz, 2009; Schulz et al., 2001) has shown that pesticides contribute significantly to the pollution and associated effects in the Lourens River. Particles entering the estuary are associated with high concentrations of chlorpyrifos (19.6 µg/kg), endosulfan (18.6 µg/kg) and prothiofos (34.0 µg/kg) (Bollmohr et al., 2007), with highest concentrations occurring during the spring and summer season. The present study focused on changes in the epibenthic, hyperbenthic and demersal meiobenthos and zooplanktonic organisms living in the flocculent layer between the sediment and water column. The importance of these organisms in anthropogenic stressor studies is discussed in Bollmohr et al. (2009c). International meiofaunal studies have tended to focus on community structure in relation to variables such as sediment composition (Sherman and Coull, 1980), salinity (Miliou, 1993) and food sources (e.g. Decho and Castenholz, 1986) that drive its composition. To ascertain the effect of pesticides on meiobenthic abundance, various studies have been performed using sediment toxicity tests (e.g. Chandler and Green, 2001; Bollmohr et al., 2009b) or microcosm experiments (Chandler et al., 1997) but only a few have used biomonitoring in the field (Warwick et al., 1990, Bollmohr et al., 2009c). Very few studies have focused on seasonal fluctuations in meiofauna or zooplankton in South African estuaries in relation to the distribution of physical factors (Nozais et al., 2005, Pillay and Perissinotto, 2009), the state of the mouth (Kibirige and Perissinotto, 2003) and food-web interactions (Perissinotto et al., 2000), and virtually no studies exist on pollutants (Bollmohr et al., 2007; Bollmohr et al., 2009c). The aims of this study were twofold: To identify the driving environmental variables (including natural and anthropogenic stressors) in a reference and a disturbed system, and to identify the extent to which these variables reflect differences in meiofaunal assemblage structure within the flocculent layer. The study took place in the False Bay region of the Western Cape Province, South Africa (Fig. 1), an area characterised by cool, wet winters and warm dry summers. Measurements within the 2 TOCE study sites occurred in the lower reaches of the estuaries and always during low tide. The Lourens Estuary mouth is located at 34º06'S and 18º49'E; the river (20 km long) rises in the Hottentots Holland Mountains, flows through intensive agricultural areas, and the town of Somerset West, after which it enters False Bay at the Strand (Cliff and Grindley, 1982). The estuary is about 0.71 km2 in area with a tidal range of 1.48 m. Mean annual runoff (MAR) is approximately 122 x 106 m3 (Whitfield and Bate, 2007). Land use in the Lourens River sub-catchment of 140 km2 comprises forestry, agriculture, residential areas and light industries. A large section of the upper catchment is privately-owned agricultural land with vineyards and apple, pear and plum orchards on which pesticide application takes place annually between August and February (Schulz, 2001). The Rooiels Estuary mouth is situated at 34º18'S and 18º49'E, with a catchment that lies within the southern extension of the Hottentots Holland Mountain Reserve and flows through the Kogelberg Nature Reserve. The total distance from the river mouth to the end of the longest tributary is only 9 km (Whitfield and Bate, 2007). The estuary is about 0.122 km2 in area with a tidal range of 1.48 m. The MAR is 10 x 106 m3 and the entire catchment (21 km2) lies within a nature reserve, with a small holiday resort located near the mouth (Heydorn and Grindley, 1982). The 20-month investigation from August 2001 to March 2003 included dry summer months (November to March) with infrequent rainfall (Fig. 2) and wet winter months from May to August. Organophosphates, such as chlorpyrifos (686 kg/ha) and prothiofos (87 kg/ha), organochlorines such as endosulfan (158 kg/ha) and pyrethroids such as cypermethrin (8 kg/ha) and fenvalerate (5 kg/ha), are frequently applied to pears, plums and apples between August and February before fruit is harvested (Dabrowski et al., 2002); frequency of application is highest during the dry summer season from November to January (Schulz, 2001) (dotted lines in Fig. 2). Various physicochemical parameters were measured every 2 weeks during the study period. Measurement always took place in the morning during low tide. The flow rate, which included the river flow and the ebb tidal flow, was measured every metre across each estuary using a flow meter (Höntzsch Co, Waiblingen, Germany) and the discharge towards the sea was calculated. Dissolved oxygen, pH, temperature and conductivity of the estuarine waters were measured with electronic meters from Wissenschaftliche Technische Werkstätten GmbH, Weilheim, Germany. Salinity was established by converting conductivity values into salinity using an automatic converter (Fofonoff and Millard, 1983). Total suspended solids (TSS) were measured with a turbidity meter (Dr Lange, Düsseldorf, Germany) and nutrients were measured using photometric test kits from Macherey & Nagel, Düren, Germany. Total organic carbon (TOC) of the sediment was quantified by removal of all organic matter, followed by gravimetric determination of sample weight-loss (ASTM, 2000). Grain-size analysis was performed by dry-fraction sieving of sediment samples previously treated with hydrogen peroxide. Sediment was divided into 7 fractions: silt and clay (< 0.063 mm), very fine sand (0.063 to 0.125 mm), fine sand (0.125 to 0.25 mm), medium sand (0.25 to 0.5 mm), coarse sand (0.5 to 1 mm), very coarse sand (1to 2 mm) and gravel (>2 mm). Each fraction was weighed and expressed as a percentage of the total mass. Four sediment samples (top 15 cm) per site (within a 1 m2 transect) were taken for analysis. Micro-algal biomass was determined in the water column and in the sediment by measuring the concentration of chlorophyll a. Four replicates of 2 ℓ water samples were filtered through Whatman (GF/C) glass-fibre filters. The chlorophyll a was extracted by grinding the filters with 10 mℓ of 99% acetone. After centrifuging, the light absorbance at 665 nm of the supernatant was determined before and after adding 2 drops of 0.1 N HCl. Chlorophyll a concentrations were calculated using the equation of Hilmer (1990). 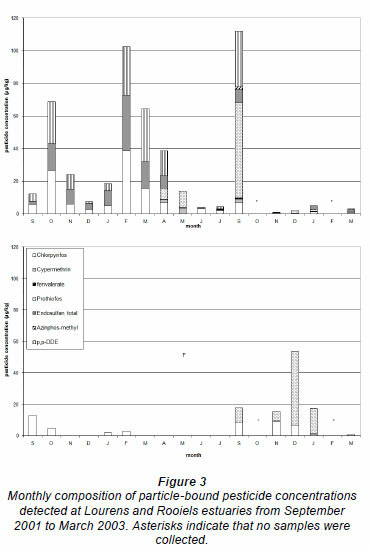 Nine replicates of benthic micro-algal samples were taken within a 1 m2 transect with a 15 mℓ syringe. Sediment chlorophyll a was extracted from the top 1.5 cm of sediment in the same way as the water column chlorophyll a.
Insecticides associated with suspended particles were accumulated continuously by a suspended-particle sampler, from which samples were collected every 2 to 3 weeks. The suspended-particle sampler consisted of a plastic container (500 mℓ) with a screw-on lid pierced in the centre by a hole 20 mm in diameter and an open glass jar suspended directly under the hole in the lid. The samplers were attached approximately 50 mm above the river bed to a metal stake fixed into the sediment. Suspended particles were extracted twice with methanol and concentrated using C18 columns. Insecticides were eluted with hexane and dichlormethane and analysed at the Forensic Chemistry Laboratory, Department of National Health, Cape Town. Measurements were made with gas chromatographs (Hewlett-Packard 5890, Avondale, PA, USA) fitted with standard Hewlett-Packard electron-capture, nitrogen phosphorus and flame-photometric detectors, with a quantification limit of 0.1µg/kg and overall mean recoveries between 79 and 106% (Schulz et al., 2001). Further details of extraction and analysis of pesticides is described in Schulz et al. (2001). The sampling approach attempted to reduce the sampling error caused by small-scale variability in the sediments (Livingston, 1987) and to sample the organisms living in the flocculent layer between the sediment and overlying water column. An area of 10 m x 300 mm was actively sampled just above the bottom using a zooplankton net of 63 µm mesh size. Four replicates were collected and within each replicate the zooplanktonic and meiobenthic organisms were identified to the lowest possible taxonomic level. Estimates of abundance were based on 8 sub-samples in a matrix box with 64 chambers, of which 8 chambers were randomly selected for identification and counting of all organisms. To assess temporal and spatial patterns of benthic faunal assemblages, the community metrics density (number of individuals/m3), number of taxa, and H' diversity (Shannon and Wiener, 1948) were calculated. Multivariate techniques are often used to link field concentrations of chemicals and other environmental parameters with invertebrate responses (Leps and Smilauer, 2003). In this study ordination methods were used for dimension reduction, i.e. to reduce the data set to a 2-dimensional summary, which can be presented as an ordination diagram. In this way a graphical summary of the data set is obtained. Redundancy analysis (RDA) is the direct form of principal component analysis (PCA) that focuses the analysis on that particular part of the variance that is explained by external explanatory variables. The significance of the environmental variables was evaluated using Monte Carlo permutation tests (Van den Brink et al., 2003). Redundancy analysis was performed separately for the 2 estuaries. The differences in community composition between the Lourens and Rooiels Estuaries were visualised by principal response curves (PRC) (Van den Brink and Ter Braak, 1999) using the CANOCO software package Version 4.5. The PRC is based on the RDA ordination technique, a constrained form of PCA. The analysis results in a diagram showing the first principal component of the differences in community structure on the y-axis and deviations in time between the 2 sites on the x-axis, with the Rooiels Estuary as reference. The species weights are shown in a separate diagram, and indicate the affinity each has with the major determinant indicated. The species with high positive weights show responses similar to those indicated by the PRC; those with negative weights, show responses opposite to the response indicated by PRC. Species with near-zero weight show a response very dissimilar to the response indicated by PRC, or no response at all. The data sets of the physicochemical variables and pesticides were tested for significant differences between the 2 estuaries using the student t-test and were also analysed using PRC. In these analyses the variables were centred and standardised before analysis to account for differences in measurement scale (Kersting and Van den Brink, 1997). Guidance on the use of PRC to analyse monitoring data is described in Van den Brink et al. (2009). Due to the different type and size of catchment, the magnitudes of many environmental variables differed significantly between the 2 estuaries (Table 1). The most significant differences (p<0.001) were for depth, salinity, temperature, nitrate, pH and TSS. In general, the Lourens Estuary is a shallower system when compared to the Rooiels (0.51 ± 0.18 m compared to 1.07 ± 0.14 m), with lower salinities in the bottom (6.29 ± 8.18 compared to 19.5 ±11.6) and surface waters (1.69 ± 2.07 compared to 5.19 ± 5.74). Both bottom (19.4 ± 4.43ºC) and surface temperatures (19.2 ± 4.44ºC) were higher in the Lourens than in the Rooiels (18.0 ± 4.20ºC and 16.8 ± 3.30ºC, respectively). The water contained significantly more total suspended solids in the Lourens (63.9 ± 39.6 mg/ℓ) than in the Rooiels (1.03 ± 1.21 mg/ℓ), and the pH was significantly higher in the Lourens than in the Rooiels Estuary. As a result of anthropogenic inputs, nitrate, nitrite and orthophosphate concentrations were significantly higher in the Lourens than the Rooiels Estuary (p<0.01), as was phytoplankton biomass measured as chlorophyll a concentrations in the water column (3.76 ± 3.98 mg/ℓ compared to 0.39 ± 0.46 mg/ℓ) and sediment (8.98 ± 8.45 mg/m2 compared to 2.29 ± 1.75 mg/m2). 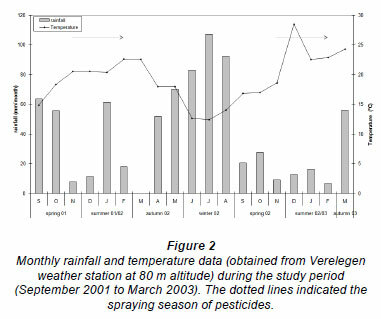 Cypermethrin (CYP) , fenvalerate (FEN), endosulfan total (END), p,p-DDE, chlorpyrifos (CPFS) and prothiofos (PTF) were found in varying concentrations during almost all months within the Lourens Estuary (Table 2, Fig. 3), with the highest concentrations occurring during spring (September-November) and autumn (March-May). Despite the absence of agricultural activities in the catchment of the Rooiels, chlorpyrifos, PTF and CYP were frequently detected. The highest concentrations occurred during the summer months (November-January) and PTF concentrations were even higher than those in the Lourens Estuary (Table 2, Fig. 3). However, concentrations of FEN, total - END, p,p-DDE and azinphos-methyl (AZPM) were found to be significantly higher in the Lourens Estuary. In the Lourens River PTF (34 µg/kg ) occurred in the highest concentrations, followed by p,p-DDE (31.0 µg/kg), CPFS (19.6 µg/kg), total - END (18.6 µg/kg), CYP (2.84 µg/kg) and fenvalerate (0.64 µg/kg) (Table 2). Cypermethrin (92%) and CPFS (92%) were most frequently detected, followed by total - END (86%) and PTF (85%). In the Rooiels Estuary concentrations of PTF (22.0 µg/kg) were highest, followed by CPFS (8.9 µg/kg) and CYP (0.42 µg/kg). Chlorpyrifos showed the highest frequency of detection (50%), followed by PTF(39%) and CYP (23%). The PRC diagram (Fig. 4) indicates differences in environmental variables and particle-bound pesticide concentrations between the 2 estuaries and their importance in contributing to the overall differences between them. There is high temporal variability, with 42% of the variation being attributable to differences between sampling dates. Spatial differences that were not linked to temporal variability explained 58% of the variation. 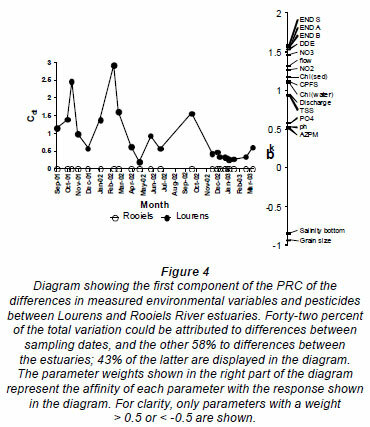 Variables that contributed most to the differences between the estuaries were higher concentrations of END, p,p-DDE and nitrates in the Lourens and larger grain size and higher salinity at the bottom of the Rooiels. Flow, nitrite, CPFS and chlorophyll were also important variables contributing to differences between the 2 estuaries. In general the meiofaunal community in the Rooiels Estuary showed a significantly higher number of taxa (p< 0.001), a significantly higher Shannon Wiener Diversity Index (p<0.001) and a generally lower abundance, with less variability over time, than the Lourens Estuary (Table 3). The PRC analysis (Fig. 5) indicated that the 2 community structures were very different from one another; 52% of the difference was explained by temporal differences and 48% by differences between the 2 estuaries. Differences in the fauna were explained mostly by more Cypretta and Darcythompsonia in the Rooiels, and more Thermocyclops and Canthocamptus in the Lourens. Overall the difference is attributable to the greater number of species in the Rooiels Estuary, which correlates with the higher diversity index (Table 3). Within the RDA biplot the most important taxa and significant environmental variables are shown in Figs. 6 and 7. 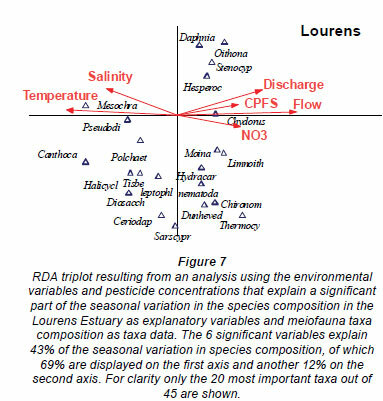 The variables explaining a significantly part (14%) of the seasonal variation in invertebrate abundance in the Rooiels Estuary were salinity and temperature (Fig. 6). The RDA indicated that the abundance of most of the taxa were increasing with higher salinity and temperatures and taxa such as Upogebia, Nereis, Uroma and the nematodes were positively correlated with salinity and temperature. The meiofaunal community in the Lourens Estuary is significantly influenced by a number of variables that are probably the result of anthropogenic impacts (Fig. 7). The variables explaining a significant part of the variance in the dataset (43%) were salinity and temperature, CPFS, nitrate and flow. Mesochra decreased with higher CPFS and nitrate concentrations, and increased with higher salinity and temperature. Furthermore, the taxa Pseudodiaptomus, Canthocamptus and polychaetes were negatively correlated with CPFS and nitrate concentrations. In general, oligohaline taxa (e.g. Moina and Limnoithona) decreased in abundance at higher salinities. Studies have shown that volatilisation can cause off-site movement of pesticides via atmospheric transport and subsequent contamination of surface waters (Harman-Fetcho et al., 2000; LeNoir et al., 1999). The Western Cape climate is characterised by strong south-easterly winds during summer with wind directions from agricultural activities southeast towards the Rooiels Estuary. Most pesticide application using mist-blow techniques occurs during the summer season (Schulz, 2001), which also coincides with the period of high concentrations found in the estuary. However, high mountains (Hottentots Holland Mountain) are situated between the 2 catchments, which could serve as a partial barrier for atmospheric pesticide transport. Additionally it is puzzling why endosulfan was not found in the Rooiels Estuary, since it is also heavily applied during the summer season. Due to the south-easterly wind direction, the current within False Bay is directed from the Lourens and other estuaries with 'agricultural' catchments towards the Rooiels Estuary (Taljaard et al., 2000). Particle-bound pesticides with a high Koc and low solubility (as prothiofos, CPF and cypermethrin) could be transported by the currents in False Bay and enter the Rooiels Estuary on the incoming tide. However, pesticides tend to bind to particles which in turn are likely to settle either within the estuary (Bollmohr et al., 2009c) or within the bay. Additionally it is hard to explain why p,p-DDE, which is present in high concentrations in the Lourens River, and has the highest Koc and the longest DT50, has not been detected in the Rooiels Estuary. Residential areas are situated on the southern side of the estuary and the houses are mainly occupied during the holidays (Heydorn and Grindley, 1982). The primary holiday period occurs during summer (December and January), which coincides with the time when high pesticide concentrations were found. Many household products contain CPFS and CYP. Bollmohr et al. (2007) ranked the pesticide concentrations detected in the Lourens River in terms of their risk towards the environment, by comparing these with various effect concentrations (Chandler and Green, 2001; Chandler et al., 1994; Leonard et al., 2001). Chlorpyrifos and total-END posed the highest risk towards both freshwater and marine communities in the Lourens Estuary. Within the Rooiels Estuary there is a possibility that CPF may pose a risk towards harpacticoid species during certain summer months (Bollmohr et al., 2009b; Chandler and Green, 2001). Toxicity data and threshold values for PTF are inadequate; therefore it is not possible to assess a probable risk for this pesticide towards the aquatic environment in either estuary. The prolonged period of mouth closure that most TOCEs experience generally leads to low levels of taxonomic diversity (Perissinotto et al., 2000). Hartwell and Clafin (2005) classified a Shannon Wiener Index of <1.5 for macrobenthos in permanently open estuaries as 'low', and above 2.4 as 'high', while a Shannon Wiener index for zooplankton in the impacted, temporarily-open Mpenjati Estuary ranged between only 1.0 and 1.20 (Kibirige and Perissinotto, 2003). Although the Lourens Estuary supports more freshwater species than the Rooiels (Bollmohr et al., 2009c) due to a higher MAR, overall meiofaunal diversity is lower than in the Rooiels, which is characterised by a greater number of taxa, most of which are of marine or estuarine origin. The higher meiofaunal abundance in the Lourens Estuary can be explained by the higher organic input arising from a greater MAR when compared to the Rooiels. The lower variability in meiofaunal abundance in the Rooiels Estuary is probably a result of the more stable estuarine environment when compared to the Lourens. Species contributing most to spatial differences were the ostracod Cypretta and harpacticoid copepod Darcythompsonia for the Rooiels Estuary (with the highest positive weighting), and Thermocyclops and Canthocamptus for the Lourens Estuary (with the highest negative weighting). Ostracods are mainly influenced by temperature, salinity, depth and grain size (Curry, 1999), and sewage pollution as a result of low oxygen (Mezquita et al., 1999). Based on toxicity data they are not significantly more sensitive to pollution than other crustaceans (Sanchez-Bayo, 2006) but have a slower recovery rate after pollution events (Dernie et al., 2003). The combination of low oxygen, salinity, low grain size (mud), higher temperature and more frequent pesticide concentrations might, however, have resulted in the loss of ostracods from the Lourens Estuary. No information is available on the harpacticoid genus Darcythompsonia and further work on the sensitivity of this genus is required. Thermocyclops and Canthocamptus are known as freshwater and/or estuarine species and might have been carried into the Lourens Estuary from upstream, whereas the salinity in the Rooiels Estuary might have been too high for these taxa to survive. Insufficient toxicity data are available for these genera to reach conclusions regarding the causality of the correlations of their abundances with the pesticide levels in either estuary. The RDA analysis identified salinity and temperature as the only significant variables driving meiofaunal community structure in the Rooiels Estuary. These variables have been identified as the most important for natural estuarine systems by various other authors (e.g. Austen, 1989; Willmer et al., 2000; Nozais et al., 2005). Grain size and water depth are often regarded as primary variables in determining aspects of community structure in meiobenthic organisms (Soetaert et al. , 1994; Curry, 1999; Sherman and Coull, 1980), but these variables showed little variation within the Rooiels Estuary. 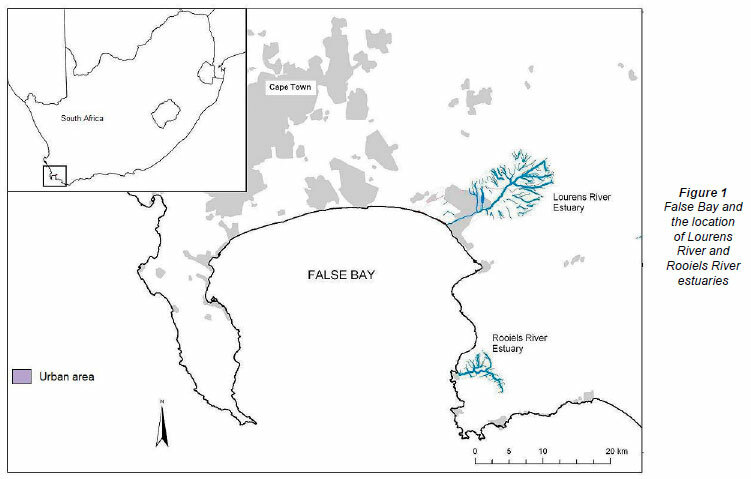 The community structure of the Lourens Estuary is, however, significantly influenced by a number of variables, including salinity, temperature, flow and anthropogenic stressors such as nitrate and CPFS. The above result suggests interactions between the effects of both natural and anthropogenic drivers on the meiofaunal community. The abundance of the genus Mesochra, as an example, increased with decreasing CPFS concentrations and increasing salinity. A microcosm toxicity test on intact estuarine sediment with the marine copepod Amphiascus tenuiremis, by Chandler et al. (1997), showed acute effects after 96 h at CPFS levels ranging from 21 to33 µg/kg. A related study by Chandler and Green (2001) found that chronic full-life-cycle exposures to concentrations of 11 to 22 µg/kg sediment-associated CPF resulted in consistently significant reductions in production of copepodites and nauplii by A. tenuiremis. These concentrations were exceeded by the 90th percentile found in the Lourens Estuary (19.6 µg/kg). A laboratory study by Bollmohr et al. (2009b) indicated that exposure to CPFS of 5.9 to 6.4 µg/kg, which was exceeded on 37% of the sampling occasions during the current field programme, was detrimental to the survival of Mesochra parva. The above laboratory study also revealed that M. parva survival decreased by 60 to 90% due to CPFS exposure and increased by 10 to 50% as salinity increased from 3 to 15. 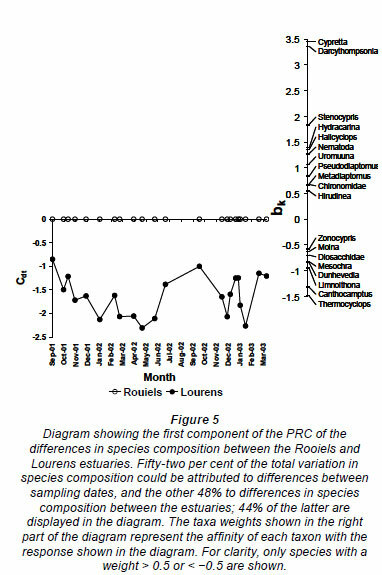 The frequency of occurrence and mean concentration of CPFS in the Rooiels Estuary (FO = 50% of samples, mean concentration = 3.21 ± 5.46 µg/kg) was very different to the frequency of occurrence and mean concentration of CPFS in the Lourens Estuary (FO = 92% of samples, mean concentration = 7.04 ± 10.5 µg/kg). These results clearly indicate an elevated and more prolonged pollution problem in the Lourens when compared to the Rooiels system. However, more work is required to understand the response of various meiofaunal taxa to this pollutant under different salinity conditions. Received 20 October 2010; accepted in revised form 30 May 2011.